It is our pleasure to introduce RegenLab, Switzerland to India. 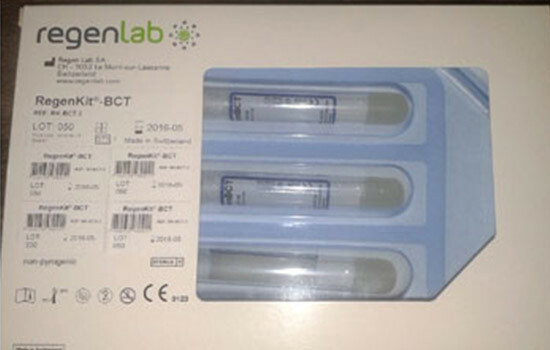 RegenLab manufactures the world leading Platelet Rich Plasma technology in the field of aesthetic medicine, orthopedic and the treatment of many other clinical conditions. More than 600 clinical studies investigate the effectiveness of Regenlab’s Autologous PRP in various medical disciplines & it’s a sole kit in the world, which had been approved by US FDA. A-PRP contains growth factors like PDGF, IGF, EGF, VEGF & TGF which will promptly in tissue regeneration. A-PRP increases the production of collagen (Cheng, 2011), enhances skin elasticity, tone and thickness (Redaelli, 2010; Sclafani, 2010). It stimulates stem cell differentiation and proliferation (Krasna, 2007), stimulates angiogenesis (Pietramaggiori, 2010) leading to skin regeneration. 1. Simple and fast process Simple and fast process. PRP is ready with only few steps in less than 10 minutes. 4. Clinical Experience Regen Lab has more than 12 years clinical experience in aesthetic indications and PRP kit is used for various clinical trials, including skin rejuvenation and alopecia. The Regen technology effectively isolates the platelet concentrate with a physical barrier (Thixotropic Gel) from the red blood cells (<2% of RBC’s Present). Regen Lab offers proven detailed clinical protocols, clinical studies, a dedicated YouTube channel with procedural videos.